Bread is a staple of my vegetarian diet. I love it warm from the oven. Fragrant, home made bread is a comfort food, and yet most “diets” suggest that bread be among the first foods one should “give up.” The white grocery store loaves may not be particularly healthy for us, but there are many ways to make home made bread nutritious and interesting. Simple white bread, made with all white flour, has a fairly high glycemic index. The glycemic index is a scale which rates foods based on how quickly they break down in the digestive system into simple sugars. Foods which break down into sugars quickly leave us hungry again very quickly. There is little nutritional value to them and much of their sugars end up stored in the body as fat. Breads made with whole grains, and other healthy add-ins, have a much lower glycemic index, and provide more nutrition. These breads can pack a lot of nutrition, make us feel full longer, and form the basis for a quick and nutritious meal. One secret to weight loss relies on eating foods with a low glycemic index and high fiber. By choosing such foods, one consumes few calories, feels full and satisfied longer, and takes in more nutrients. Dried apricots and cherries, almonds, honey, and cinnamon pack nutrition into this holiday bread. Most any ingredient can be added to bread. I’ve even made a delicious dark chocolate cherry bread on occasion! Once you understand the basic principles of bread making, it is easy to craft a satisfying and nutritious bread. My basic bread method comes from that developed by Dr. Jeff Hertzberg, MD, and pastry chef Zoe Francois, published in their books on crafting bread at home. Many of us think about improving our diets and losing weight in January. Beans, a low glycemic index food full of vitamins and protein, also contain fiber to help us feel full and lose weight. 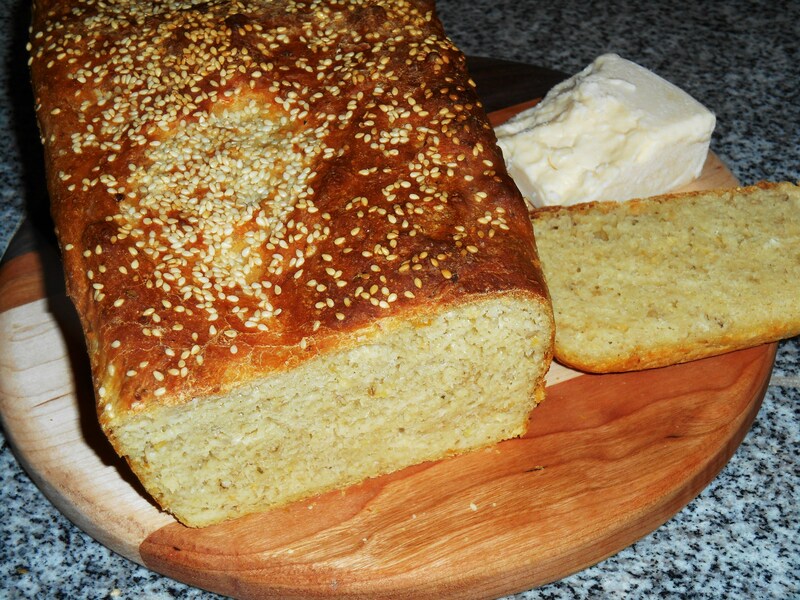 I’ve added them to this healthy bread recipe in such a way that only the baker will know! You’ll also find oatmeal, honey, rosemary, cheddar, and olive oil in this savory winter bread. It looks and feels like “white bread,” but has a savory aroma, satisfying flavor, and is very high in protein. To make this recipe even more versatile, you can bake it into a loaf for sandwiches or toast; shape it into dinner rolls; use it for pizza crust, or cook it on the griddle as Asian flat bread. This dough is finished, and ready for its first proofing. It should be covered with a damp tea towel and allowed to rise for about 2 hours. This is a “Slow Bread” recipe. Mix it on a day when you are unhurried and can enjoy the process of making bread. Take your time combining the ingredients. 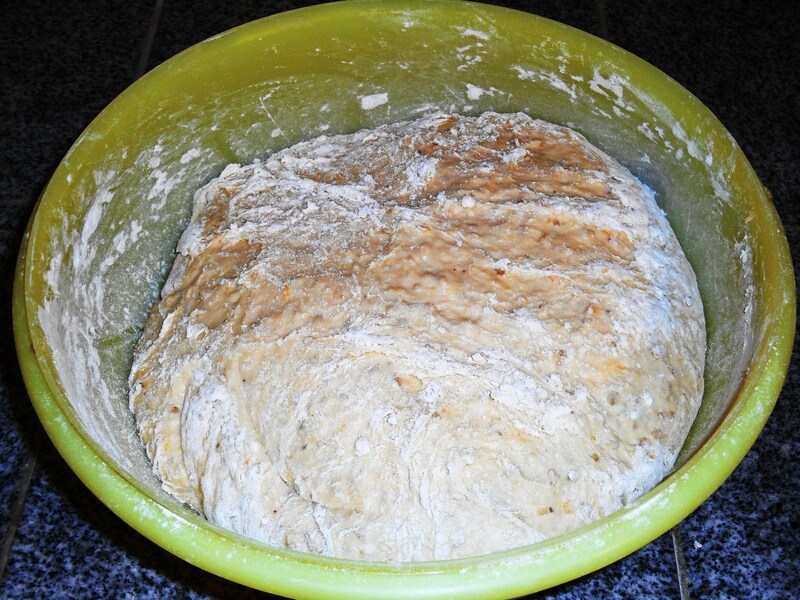 After the first rise, refrigerate the dough for at least two hours, or over night. The dough is easier to handle chilled, and time chilling improves both the texture and flavor of this bread. This recipe makes enough for three to four loaves. You can mix it on Sunday, and then use the dough several times for different dishes during the week. Savory Lentil Bread, cooled and ready to enjoy. Rinse 1 c. of red lentils, and combine with 4 cups of water in a large pot. Add 1 c. of steel cut oats, 1 TB of dehydrated onion flakes, 1 tsp. of sea salt, and ½ tsp. of chopped dried Rosemary. Bring to a boil, and allow to simmer at low heat for 20 minutes or so until the lentils are tender. Remove from heat, and pour the mixture into a large bowl to cool. This mixture must cool to room temperature before you proceed with the recipe. The finished bread has an even texture. See any trace of the lentils or oatmeal? The yellow color comes from the chick pea flour and egg in the recipe. When the lentils are cool, mix 1 large egg, ¼ c. sour cream, 1 ½ c. water, 2 TB of olive oil, and 2 TB honey together in a measuring cup. Whisk until smooth. Pour the cooled lentil mixture into the flour, and then add the milk and egg mixture. Stir to combine, and let the mixture rest for 5-10 minutes. It should begin to look a little bubbly as the yeast is activated. This is a very loose batter. Begin adding in white bread flour, a cup at a time, and stir to combine with a rubber spatula or wooden spoon. Stir from the edges of the bowl towards the center, folding the dough over on itself. Continue adding flour in this way until the dough forms a firm ball and has lost most of its stickiness, about 5 cups. More flour may be needed, depending on the type of flour used and whether any whole wheat flour was added. Allow the dough to rest on the counter away from drafts, loosely covered, for about two hours. A slightly warm (under 100 F) oven is also a good place for the dough during this first proofing. Cover the dough with a damp tea towel or a sheet of waxed paper, sprayed lightly with cooking spray. The dough should double in size, and begin to fall back in on itself. The beauty of this recipe is that you mix the bread once, when you have time, and then use the dough for different recipes over the next several days. The dough will keep, sealed and refrigerated, for 7 to 10 days. 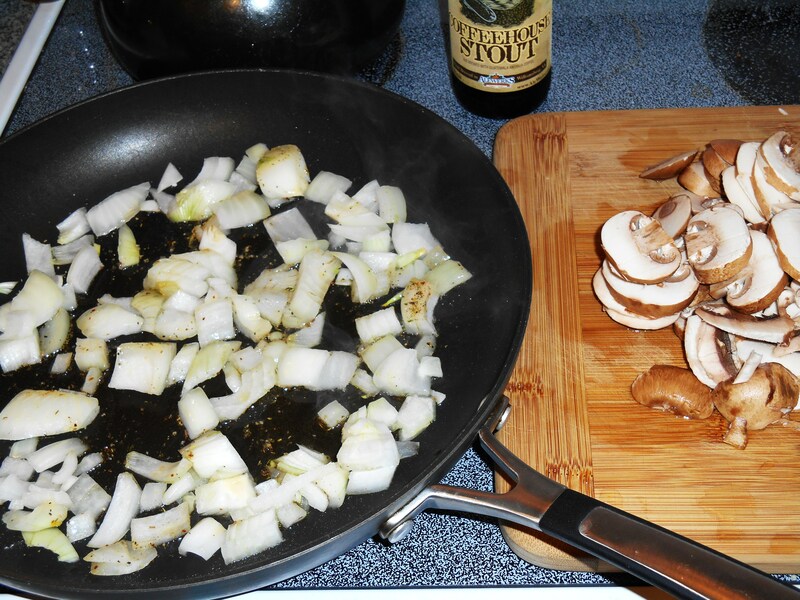 Begin the pizza toppings with olive oil, salt, and ground spices in a saute pan over medium high heat. 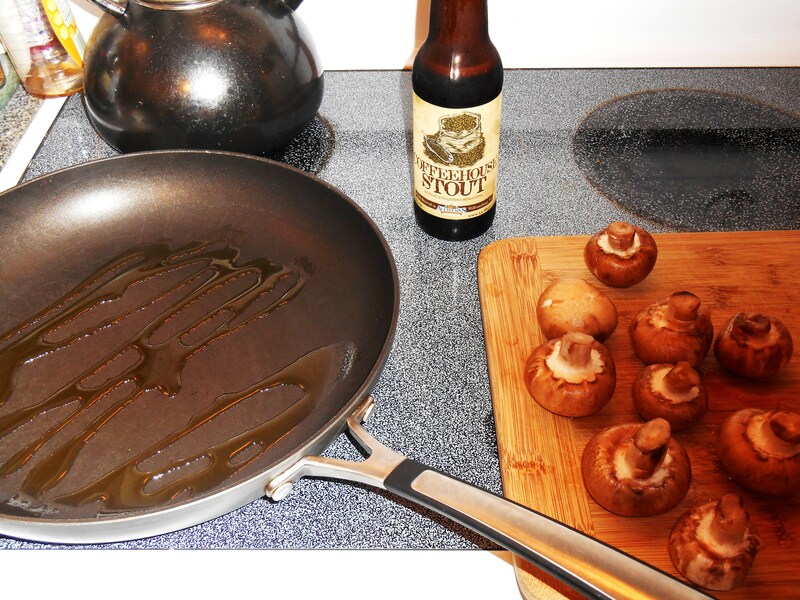 The stout, made at a neighbor’s brewery here in Williamsburg, is for the cook, not the pizza. Sprinkle the chilled dough with ½ c. of flour, and dip a large knife in flour. Use the knife to cut the dough into 4 fairly equal portions. Remove one portion to a board sprinkled with bench flour. Lightly stretch the edges of the dough to the bottom, forming a smooth round ball of floured dough. Return the remaining dough to the refrigerator for another use. 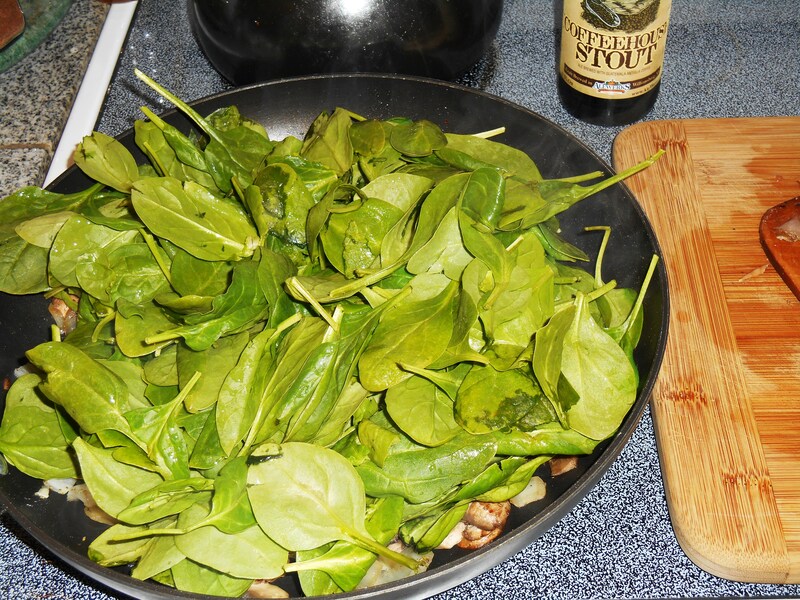 Sauteing the sweet onions, mushrooms, and spinach allows their moisture to evaporate before adding them to the pizza. Season the vegetables with salt, pepper, garlic, and herbs to bring out their flavors. 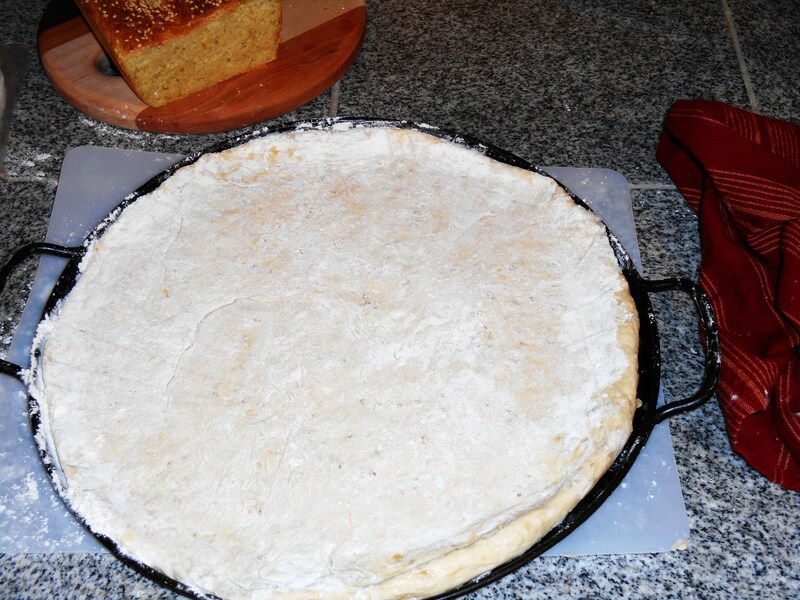 For a loaf: Shape the dough into a long oval, and place in a prepared loaf pan. Allow to rise for an hour, loosely covered with waxed paper. Preheat the oven to 400 F and brush the top crust with water, or egg white mixed with water. 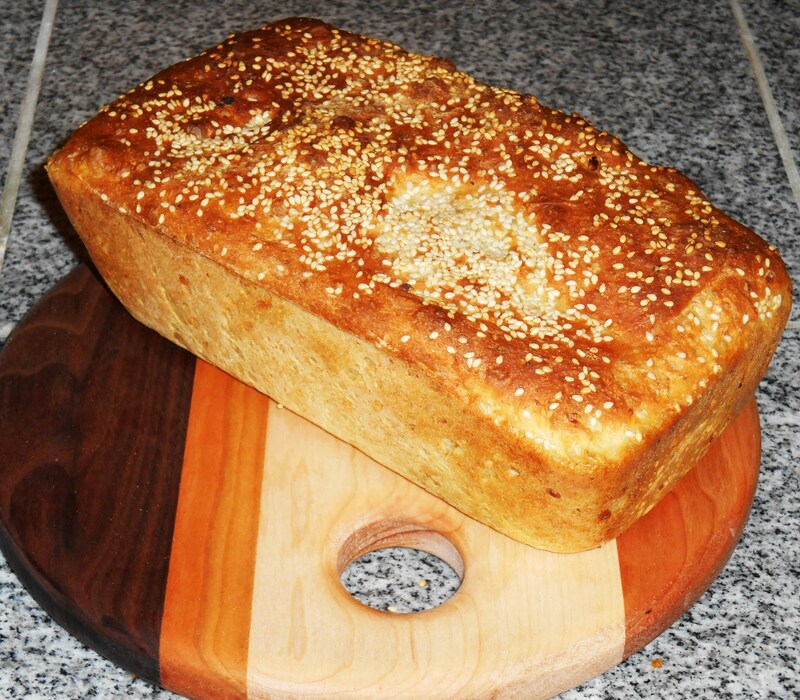 Sprinkle the loaf with sea salt and sesame seeds. Bake for about 30 minutes until golden brown. This is a whole bag of pre-washed organic baby spinach. It will quickly reduce in volume, absorb wonderful flavors, and add tremendous nutrition to the pizza. For a pizza: Flatten into a round, and then stretch or roll the dough to the desired size. Form the pizza on a pizza peel to cook on a pizza stone, or form it into a pizza pan. Add cheese, toppings, and bake at 450 F for about 20 minutes. For rolls: Cut the round of dough into 12 equal portions. Shape each into a ball, and place into a prepared pan. Loosely cover, and allow to rise out of drafts for 45 minutes to an hour. Brush with melted butter, and bake at 375 F for about 30 minutes. Make large sandwich rolls by dividing the dough into portions the size of a lime, and slightly flattening each roll after placing it into the pan. Space these rolls a little further apart so they spread out slightly as they rise. Brush the tops with diluted egg white or melted butter, and sprinkle with sea salt and any combinations of seeds and herbs you enjoy. Stretch the dough to fit a pizza pan, or make a free form pizza on a wooden pizza peel. My pizza stone is preheating in the oven. This pan has a perforated bottom so the crust rests directly on the stone. For flatbread: Cut the dough into 10 or 12 equal portions, and roll each portion into a ball. Preheat a skillet or griddle to medium high heat. Flatten each ball into a thin round with a rolling pin. Brush each round with olive oil or melted butter, and sprinkle with additional salt, garlic powder, herbs, or other flavorings. Cook each prepared flat bread for a couple of minutes on first one side, then the other, turning when the bread has lightly browned. The bread should puff up and blister as it cooks. Cook flat breads one or two at a time, depending on the size of the griddle, keeping them warm in a slightly warm oven until all are finished. 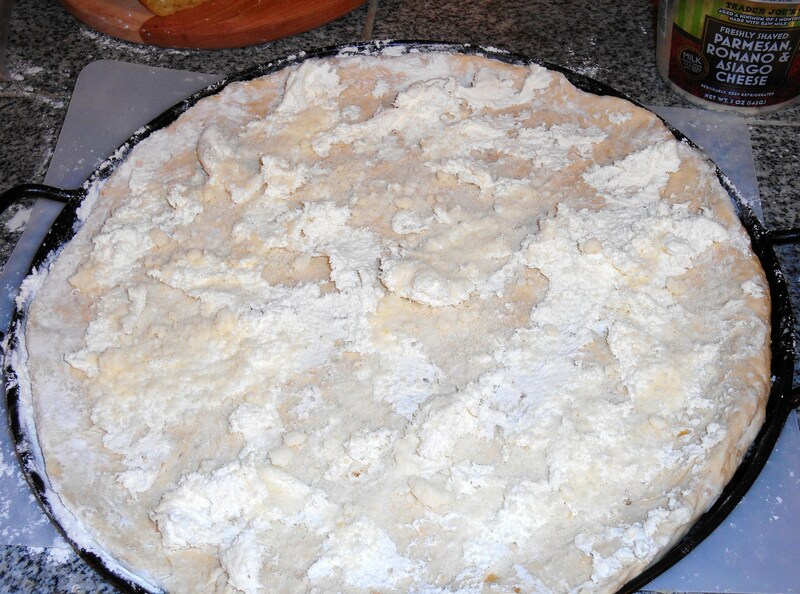 This is low fat whipped cream cheese, which makes a creamy and delicious base for the pizza. I’ve sprinkled garlic powder and finely grated Parmesan over the entire crust, especially the edges. Making our own bread gives us tremendous control over our own health and well-being. We can enrich our breads with nutrient rich foods and whole grains, while leaving out the many non-pronounceable additives commercial bakeries use. We bake our bread when we intend to use it so it is fresh, and doesn’t require a long list of preservatives. We don’t have to wonder who has handled it ahead of us, or how much fuel was burned in getting it from the bakery to our table. But mostly, making our own bread makes the house smell really good, and we all enjoy the anticipation of that first warm slice. 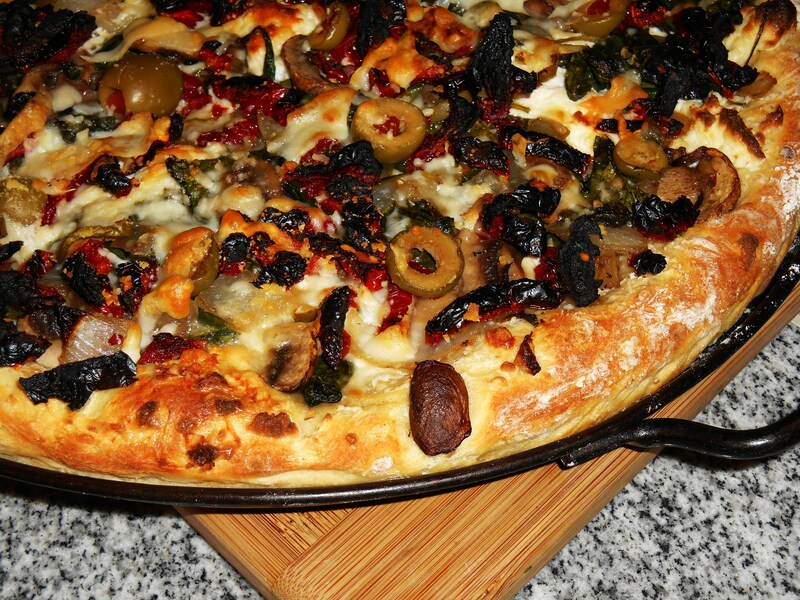 Green Sicilian olives, sundried tomatoes, and a mixture of grated cheeses top this pizza. Mozzarella could be added, but I was out. What a beautiful crust this bread dough makes!